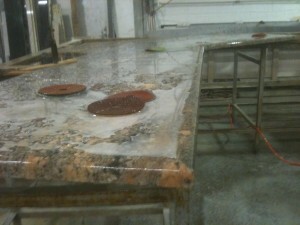 There are distinct differences in how granite can be finished. Choosing the finish can affect not only the look of the stone, but it’s surface tendencies as well. As it implies, a polished granite is the most shiny and reflective surface. This is considered a glossy mirror finish. The full color, depth, and crystal structure of the stone is visible. 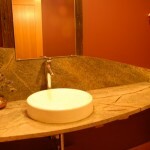 Your stone appears darker the colors seem richer than what you would see from the raw stone. It will also highlight more of the character out of your natural stone, making it the most desired and most chosen option for counter tops. The surface is much easier to keep clean and free from staining. A polished finish seals or closes more of the pores of the stone surface which helps the stone repel moisture. It is nearly impervious to weather and chemical wear. The harder the stone is that is being polished, the harder it is to polish and therefore it is more likely to retain it’s shine for a long, long time. To achieve a honed surface finish, the finishing process ends prior to the buffing stage. The result is a smooth surface without reflection. A perfectly honed granite finish is one without scratch marks. The finish remains flatter than a full gloss polish. Generally this finish is preferred for floors, stairs, or other locations where the presence of water might make a polished finish slippery, or where foot traffic may wear off a polished finish. A honed finish is much more common for marble counter tops, as marble is a softer stone and therefore the polish scratches more easily. 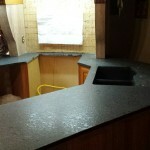 However, honed granite can be, and occasionally is, used for kitchen counter tops. Taking the high gloss polish off of your stone will decrease the depth of color, and depending on the type of granite, can make it more susceptible to surface staining. The leathered finish out stands the honed by giving a more sophisticated look to the stone. The leathering process closes the stone pores which helps it to become more stain resistant than the honed surface. A leathered finish retains the stone’s natural color, while the honing process washes out the natural color. A leathered finish also hides fingerprints and water spots better than a polished surface. I am finishing a bullnose edge of a counter top and keep getting a white frost appearance. I went from 50 grit to 3000 grit in 8 steps and a buff at the end. I am using a grinder that has a water attachment flowing through the pads backing. It is difficult to say what you are doing wrong without seeing the work. There are a several possibilities, like you may simply not be using enough water. You also may not be holding the grinder flat. 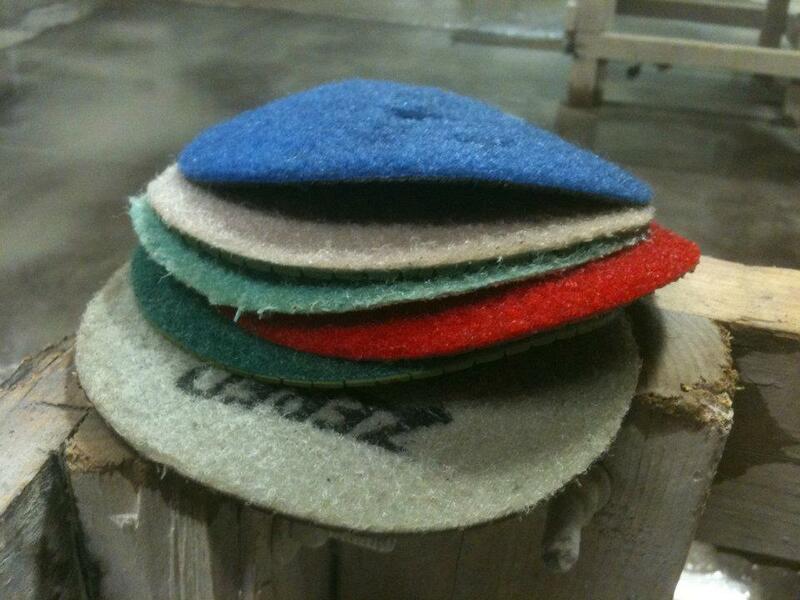 Another possibility is that you aren’t spending enough time with the 100 or 200 grit pads. We recommend that you let the piece dry after each pad which may help you determine where you are going wrong. Originally from Batavia, now living in Hawaii and looking for an independent answer on a question from our recently installed granite kitchen countertop. The polished finish does not appear to me to be completed, or polished enough. There are spots, cracks or small areas on the surface that you can see (if you look at just the correct angle with the light) or feel when you pass your finger over it. To the touch you can feel the rough or unpolished spots. Is this something that our installer can easily fix, and is it a result of not polishing the granite for a long enough time period before it was actually installed? It is difficult to answer this question without seeing the material. Different colors of granite have different compositions. 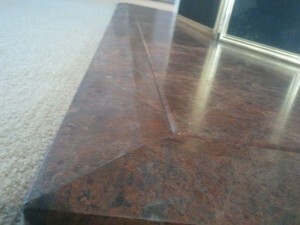 Sometimes there are inclusions, like mica, that come to a different polish than the rest of the countertops. Your installer should be able to address this issue, and possibly come out and refinish the top. If you know the name of the granite that was installed, we can most likely give you a more thorough answer as to what the problem might be. I’ve heard you can oil or make leathered granite shine but not sure what to use to do that. Any suggestions? 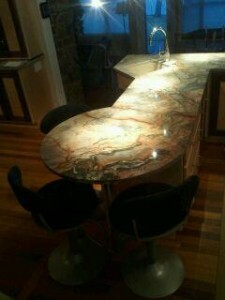 Without knowing what type of granite you have, it is difficult for me to make any recommendations. I suggest you call our shop, at 585-586-6510, so I can discuss some of the details with you about what your options are. LOVE THIS! Absolutely perfect, and looks super easy! I’ve been wanting to redo my kitchen, but I’ve been intimidated by the amount of work it takes. Thanks for sharing this project for beginners like me. 🙂 Just ordered by BB Frosch chalk powder paint, and I can’t wait to get started! Thanks for the great article. I have been looking at leathered granite for my new kitchen. However, I have a couple of question. 1. One of the places I visited told me the leathered will go glosses if oil or butter is left on it (not that we plan this but I’m not always the only one using the kitchen). He told me no matter what, it will go glossy. Now this company had no leathered granite in stock and would have to send out to have done. 2. When I go looking at granite, it seems the only samples of leathered granite are always in dark color and my concern is that the look I am going for will not carry as well to light colored granite. I know all colors can be leathered but do lighter colors wash out too much? 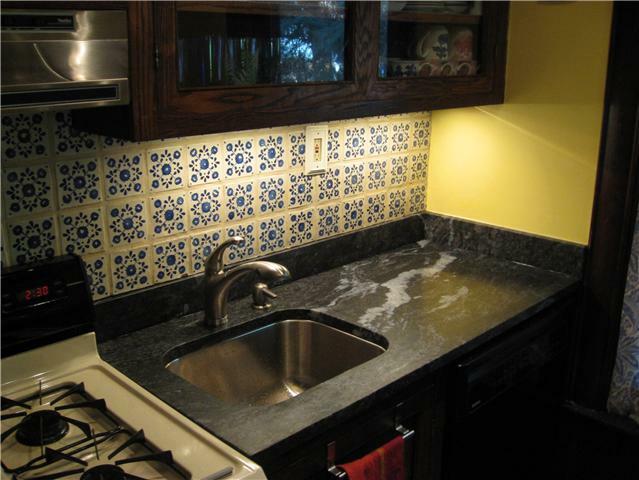 Leathered and Honed granite can become glossy if oils are left on the material. If the stone is properly sealed that shouldn’t be a problem. Generally lighter colored granite will need more frequent sealing than darker granite. I have seen some very beautiful light color leathered granite. The color does not wash out at all. Thank you so much. I wasn’t planning on a pure white so hopefully it won’t be an issue then. Hi I have leathered steel grey tiles, need to know how can I bring the leathered shined finish, is it by using sealant or mechanical means, please advise. You can treat the tiles with an ager which will darken them and give them a little more shine. Leathered stone can’t really be brought to a full shine. What is a satine finish ? Can you explain ? Satin finish is another word for Honed finish (see above). While it is not impossible to take a polished finish down to a leathered finish, it would be pretty costly as well as very messy (it is a process that requires the material stay wet). Leathered finishes are done to the slabs by large machines during production, and before they reach the fabricator. It would be difficult to duplicate a leathered finish by hand, especially after the counters have already been installed. It isn’t a procedure we would recommend attempting. You can certainly call fabricators in your area to see if it is something they would even be willing to attempt. That is what I thought the answer would be…..thank you! !